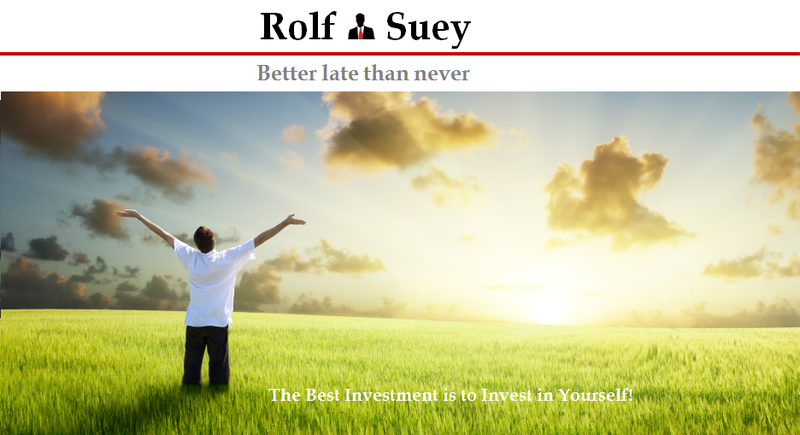 Rolf Suey - Better Late Than Never: Rolf’s investment philosophy (Part 3) - Building a Portfolio! In this finale of the trilogy for Rolf’s investment philosophy/strategy, I will discuss strategy to build Rolf’s Equity Portfolio. To recall, Part 1 here discusses the need to build up the right character and Part 2 here identifies the importance of understanding the business and building up your human capital in the early stage of your life. In my opinion and of great relevance to me, the understanding Part 1 & 2, lays the foundation of successful investing. Ideally I prefer to have 20 stocks or more. Not just for numeral diversification, but for personal interest of knowing how different companies run their business across different industries. Too little stocks, I cannot learn much…too many, no time to monitor! I am not discounting the possibility of me owning lesser stocks one day. Yet, I reckon my stocks + watchlist stocks shall be between 20-30 stocks at a minimum. Invest in things you already know or have an edge in. Investment without research is like playing stud poker without looking at the cards. Well, I will not elaborate too much further on Lynch’s ideology/examples. You can easily “google” or simply read his book. Instead, in the following, I will use more of own examples. Prior to the onset of the oil plunge in Oct 2014, I owned large percentage of O&G stocks in my portfolio. Having work in the industry and have a better insight on the business model of various stocks, I made a few critical decisions then and fortunately it turns out to be right. For instance, I sold most of the stocks during the early stage of the steep oil plunge, either taking profits or mitigate losses. I also sensed trouble and had not added any O&G related holdings since more than a year back. Despite being more careful having worked in the industry, I am not immune! I am still holding on to three O&G stocks today that had suffered colossal damages. Mind you…that is not to say that these stocks will not rebound. Imagine there is sudden unforeseen news that send Oil price soaring again. As a rule of thumb, it is easier to understand the business of stock if you worked in the same industry. But never be complacent and think you know a lot and start skipping the detail reading of articles/reports of the company. Likewise, it can also be a business that you have “rub shoulders” with frequently. For e.g. after I was admitted to Raffles Medical due to an accident in 2013, I started investing in the company. Very briefly, I am long term bullish on consumer, healthcare, data/internet or even telco! For Reits and property, I am neutral now (waiting for a better entry point) but also long term bullish. Ok, you may wonder why I am still long term bullish on Singapore telco, since IDA announced the fourth operator. Read : Recent Actions - Sold Telco! Short Term Bearish, Long Term Still Bullish! Pertaining to cyclical stocks e.g. Oil and Gas, shipping, construction, I am not quite comfortable. I feel that banking stocks will face short term headwinds and moreover their businesses is “too difficult” for me to understand entirely. In the long term, I am optimistic about the future of Singapore, ASEAN and China. Hence I prefer investment exposures inclined towards these countries. Invest Asia 2016 Seminar – Key Takeaways from Kishore Mahbubani et al on ASEAN!China stock plunge - From Horse Mouth of Mainland Chinese ResidentsCapitaRetail China Trust to Continue Thriving in a Pessimistic China Economic Outlook?Why China Today is so Different - My Own Travel Experiences in the Last 10 Years! I did own close to 30 stocks at one point last year. This is before I disposed most of my equity holdings to hold substantially more cash in the 3rd quarter last year. Since the start of this year when STI tumbled, I had been deploying part of my warchest. My stock buy or watchlist this year will generally revolves more on those shares which I use to own/traded before which apparently also means stocks that I know well. Or at the very least, those stocks I had analyzed before and been in my watchlist for awhile. Ideally, I like to buyback same stock at a lower price, which I had previously sold at a much higher price before. Ok, you cannot time the market. That is true! That said, it is still possible to ascertain if a stock is over or under-valued to facilitate some of our short term trading desire! Read the last section of this article. I attended one Motley Fool.sg seminar, where the topic of portfolio management is addressed. 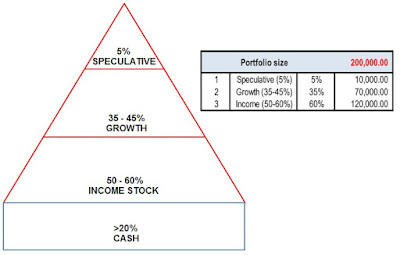 The management strategy is generally Pyramid investing! I think this plan makes a lot of sense to me and hence while using Fool’s strategy as basis, I also improvised to create my own strategy as follows. Avoid or have less exposure in companies that are too “hard”. E.g. Oil and gas companies may appear too hard for many to understand. My “hard” pile consists of bank stocks! 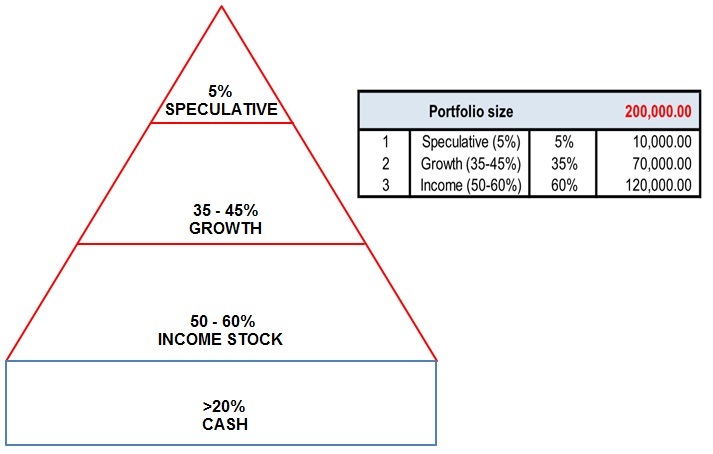 First, classify all stocks in my portfolio into 4 categories. Categories are guidelines to me and not hard rules which I don’t lose sleep over it, if there are slight deviations. Bear this in mind. Speculative : stocks that looks interesting but have some risks, and you less sure of. E.g. the oil and gas stocks now, penny stocks or in general cyclical stocks. Growth : stocks that have consistently grow their EPS at least 5% p.a. Income : stocks that have consistently pay out dividends of at least 5% p.a.. E.g. Reits, Telco, certain consumer companies etc. Below is an example to show how I organise my portfolio. It is for reference and they do not reflect my existing portfolio size. According to Fool.sg, it is also better to space out your buys to reduce risk. E.g. you can wait for 6 months to 1 year before adding the same stock. PS: I do not follow this rule strictly. You can also read following article on my strategy to deploy my cash during a market decline. If the market remains bullish, I strive to consistently buy stock every month based on the excess cash I had from my monthly income. Not warchest! This excess cash to invest each month is after taking consideration of unforeseen circumstances etc. Fool.sg recommended investor to keep 20% cash as warchest to take advantage of a downturn. In the current market outlook, I am more cautious and decided to keep more cash. Hazy Outlook Ahead – Cash as Hedge?My Major Stock Portfolio Selloffs in 2015 - I use more "Gut" than "Logic"! Long term investing calls for the elimination of frequent buy and sell (“trades”). This I agree and I have most stocks that fall into this category. However it does not mean that this is the only way to achieve success via investment. I believe that sometimes, you can also have several stocks that you performed short term trading too! This can add some spice to your investing! But remember to be strict and keep the amount to the conservative non-risky range. Also remember to set and apply your cut loss benchmark for short term trading. For short term trading, I prefer to trade BLUE chip stocks that are sort of depressed or volatile now due to the short term outlook! Currently, my portfolio is far from perfect and is a “long long” way to go before it becomes “solid”. Being solid to me means robust and can weather the “big bear” and not crashed out/bankrupt. It also mean to be sustainable with significant dividend payout over time, and with little monitoring needed. Ultimately, this portfolio should be one that is tailored made to be most suitable for me. And it is going to be a portfolio that will continue to evolve over time, improving to be better and stronger. Not just on building a portfolio. We should learn to look beyond single stock performance and look at our investment portfolio performance and level of annual cash flow generated over number of decades till the day we stop this investment game. That is the final measure of our investment performance. Yes thanks for the advice. There are so many things and not all is listed definitely. 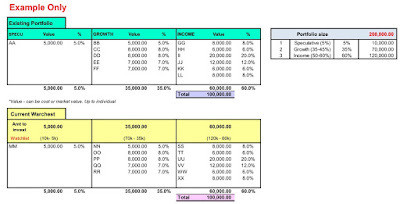 Risk, how to track your returns, outside equity portfolio etc. Indeed I do track my portfolio performance. I also have many excel sheets tracking my portfolio, but I did not list here. But unlike u, there isn't as many wonderful charts as I reckon bcos I am still a newbie in this area, having only started investing in 2010 compare to yourself who started decades ago. Still got lots to learn from all u guys! 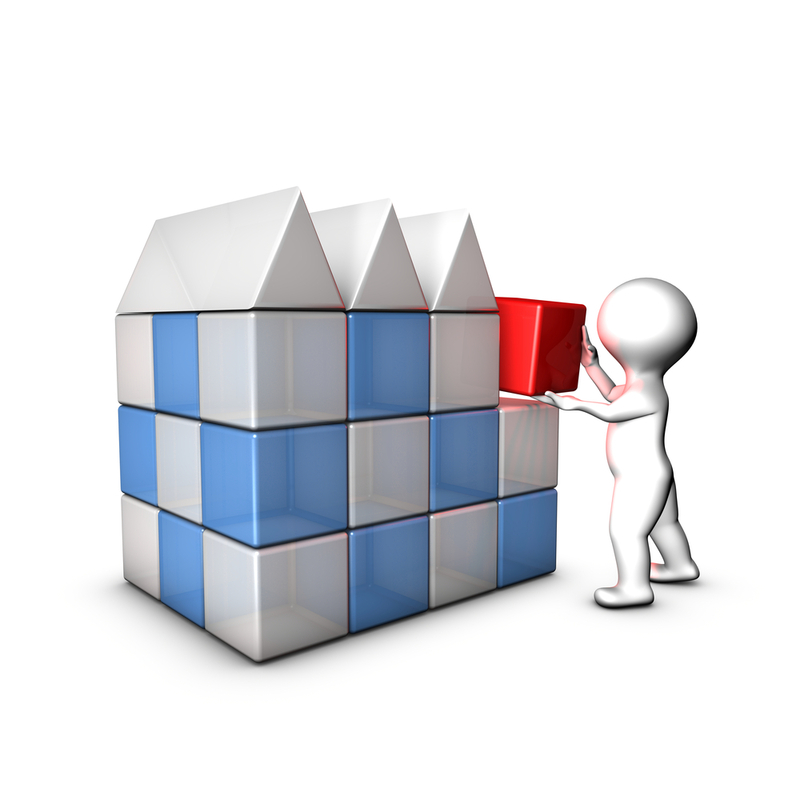 Investing's portfolio management is another word for risk management. Which is another word for money management. "If we take care of the downside risks, the upsides will take care of themselves." As I mentioned in your posts, I like it a lot about WB 1st and 2nd rules. U definitely hit the nail on the head! Therefore risk and capital preservation are something I really take note nowadays more than ever before! For trading, I am still so new... Hope to have time to learn more maybe one day. However for a full timer in day job, I suspect it is very difficult for me and hence I will still stick mostly with Long term investing. By the way, what is 3Ms? Method - Fundamental, technical, rojak? Money - Money or risk management. "Trading for a Living" by Dr Alexander Elder. Thanks for the 3M approach decipher! X factor is crucial since it cannot be learnt that easily! Or at least u ll not have X factor just by parroting out WB or Peter Lynch investment theories! I also heard some seminar speaker mentioned 3R, Right biz model, right mgmt, right valuation n price! Any cat who can find food for itself is ok? 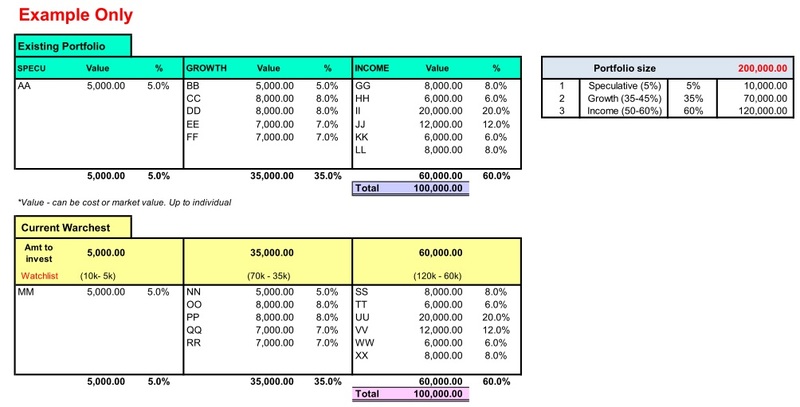 At the end of the game of investing (not only in stocks) still the CAGR you achieve counts. Not even 10 or 20 years time (if GOD permits). So try not to lose money first is more important then trying to keep up or beat the yearly inflation. So beware of scammers too. If can't even protect or preserve Capital, what investment then? It seems i say it this way because of my age. But don't forget i was from youth too, once. And don't subscribe to the belief you can afford to take higher risks (losing money) as you are still fairly having a lot of HC. Why want to try higher chance of losing money because you are young? Can make more money meh? Actually hoh in short what i say is what SMOL said lah. "Take care of your downsides, and the upsides will take care of by itself"
I am still new in investing. So I am taking one step at a time to learn as much as I can while still only part time. It's a long journey for me! And for most of the things I venture into, I always prefer to build a very strong foundation. So I have been reading and writing and trial and error in the investing of stocks a lot in the last few years. I think so far, for part 1 & 2 which I mentioned building character and human capital, I did somewhat had already strengthened due to my life and work experiences. For part 3 which is portfolio n execution, still long way to go. As Andy pointed out before, I truly understand that the number of hours spent in investment is not as relevant as the number of decades of experiences seeing the ups/downs in stock market. So I understand what u mention about the whole life in front of us! I still have lots to learn from all u Qian Beis! That is why I written before that I am happy to see the bear recently and to experience the pain of seeing my stocks decline now actually. Losing smaller money now is good for learning! Yes definitely like you said, it does not mean we should be taking more risks and have more losses. At least what I am saying is with unexpected events, at least I am still resilient and can comeback even stronger! Thanks for all the advices! Appreciate it! 1) Invest in stocks that I know well -> Would that limit your diversification possibilities? 2) Diversified across countries -> Only Singapore, ASEAN and China. Aren't they highly correlated? Also highly correlated to your own income? What about other regions of the world to reduce the correlation in your portfolio? The knowledge / familiarity gap could be easily closed via Country-ETFs. i have thought of diversification by investing in Country-ETFs. But i am worry about our Strong SING $. Any remedy or counter measure. My philosophy is only as good as my "green" experience now! So I appreciate all the comments to point out "anything amiss" more than just me being proud of the articles! Country ETFs I am new, will take a look definitely if you provide advice? To be honest, I use to prefer wide diversifications, but as I evolved, I realise that I tend to do better in stocks I know very well or at least comfortable with. The same principles have been true for me since young age! While I am still new in my journey, and to mitigate risks because of my inexperience, I still diversify to reduce risk, but do have inclination over certain sectors and countries as I mentioned. For the countries diversification, I am NOT only looking at Singapore, Asean or China now. But what I already mentioned earlier is I am bullish on these regions and will have a higher percentage towards it. If my gut proven more and more right, then I will rebalance with even more weightage as time passes! There are so many investment possibilities in the world now, but since I am still pretty new in this journey, I prefer to stick with areas that is nearer/ familiar to me first, while having open minds to learning outside this comfort zone! I believe in strengthening the core, and then spread it outwards slowly step by step! That said, I do note the movements in tandem when concentration is in Sg, Asean, China! Still, I am damn bullish about these places where i m familiar now and over longer term n do not mind the short term volatility. Worrying is what we do to avoid taking action—it's our habit. But it never gets us anywhere. Just saying. I don't really have a remedy against currency fluctuations other than seeing part of my portfolio denominated in other currencies as a crucial component of diversification. Your comment triggered me to have a look at how the SGD performed vs. other currencies over the last two years (just a random time frame). Investing, say, 10,000 SGD in a broad based US country ETF would have delivered a currency gain of about 11% (only currency gain, I ignore any capital appreciation). The same 10,000 SGD invested in a Euro ETF would have resulted in a currency loss of about 9%. And invested in CNY denominated ETF a gain of about 7%. I guess, the beauty of the SGD is that it is always hovering somewhere in between the other major currencies. Not too bad. Whether it will continue to do so, nobody knows. Your philosophy does make lots of sense too. At least you have thought it through and considered all the angles. It is always beneficial to know where and how large our circle of competence/comfort is. Everything outside the circle represents something that challenges our existing truth. Where is the greatest amount of learning for us? Inside or outside the circle? TrueWealthPublishing is an honest website with great independent advice from Kim who has ample years of experience. Subscribe to it, if you like it. Thanks for the article. By the way, where can we buy all these ETFs from? Fund supermart or just local banks? Or any good platform to recommend? The world is so connected now! Maybe should buy Russia, North Korea and Mynamar! Perhaps they have lesser if not least correlation with the world now. The ETFs listed under SGX can be bought via local banks. The choices are a bit limited. I do procure most of my ETFs via my brokerage account with TD Ameritrade in the USA or my local bank in Germany (for those European based ETFs). I don't think that there is any ETF on North Korea, haha. Myanmar can be bought only indirectly. I have a Tracker Fund that tracks the Solactive Myanmar-Focused Asia Index and contains 15 companies with a strong focus on Myanmar (eg Yoma Strategic Holdings, but currently 50% weightage on Thai listed companies). The mgt. fees for such exotic ETFs are quite high though 1.2% p.a. in this case. But I believe in Myanmar! Thanks for the recommendation! I did check out the solactive myanmar focused asia fund and it is interesting. I also see it's more oil and bank at the moment. Will have a bite when the time is riped for me. I read this article and its give me good idea how to invest money in business and how to deal customer with easy tips thanks for share it marketing personal statement .